Dril-Quip's training personnel have been associated with drilling and production operations for years, and this experience is utilized in all aspects of employee and client education. Dril-Quip has always considered in-house training as one of the most important aspects of success. We continue to expand our training resources and tools to ensure that Dril-Quip personnel and their clients fully understand product applications and procedures. Dril-Quip offers training to both our employees and our clients in a purpose built, theatre-style auditorium. We utilize interactive graphics, discussions, training manuals and full scale models to ensure our products are being designed, sold and installed correctly. We also offer tours of our manufacturing facilities so they may better understand the various stages of the manufacturing process. The employees and clients will leave with a full understanding of our company, the products, features, benefits and operation prior to installation. We also offer a comprehensive, three-segment course in the use and installation of drilling and production equipment for subsea, jack-up and platform applications. The course's subject matter covers equipment design and running procedures for current offshore drilling systems, and provides an overview of the latest methods and technology to increase operational efficiency. Dril-Quip offers comprehensive training (both classroom and e-learning) to all of its employees worldwide from Engineers to Field Service Technicians in an effort to ensure our employees are well versed in, not only their own specialized fields, but all aspects of Dril-Quip products and operations. Dril-Quip also regularly opens its doors to both high school and college students who are looking to learn more about the industry and gain valuable insight into a possible future career. During what we call "Camp Dril-Quip" students attend several days at our facility receiving instruction which includes an overview of the industry, our company and operations, and a tour of our facilities. 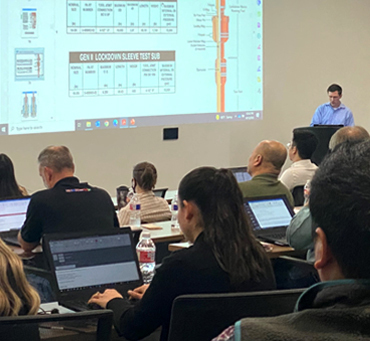 Dril-Quip is continuing its dedication to the highest quality industry training with plans for a new advanced training facility to be built at its Houston Facility. We are also expanding our training curriculum and scope to better train our clients and employees wherever they are in the world. All classes are conducted in Dril-Quip's Houston Training Center. Customized classes are available upon request, provided time is available and minimum head count requirements are met. Contact the Dril-Quip Marketing and Training Department for more information.